Does Purity Really Matter When Investing in Precious Metals? Question of the Week: Does Purity Matter? Bullion investors often ask the question: Does purity matter? Well, sometimes yes, and sometimes no. melt value of the gold or silver product in question. For instance, while not all of the popular one-ounce gold bullion coins are created equal, they do all contain one full troy ounce of gold. A karat is used to measure the purity of gold. 24 karats is pure gold and anything less, is the specifed number with the remaining being another metal. a full ounce of gold. Both the gold coins from the US Mint like the Gold Eagle and South African Krugerrand are only 22 karat gold, and thus only contain 91.67% gold. But each coin still contains one full troy ounce of gold. In addition to the one troy ounce of gold, there is other metal alloyed (copper, and, in the case of the Eagle, some silver as well), which makes the overall weight of the Eagle and Krugerrand coins 1.091 troy ounces. The Eagle and the Krugerrand, widely considered the two most popular gold coins in one-ounce form in the world, are alloyed with copper to provide additional strength and durability. In the case of the other popular one-ounce gold bullion coins – the Maple Leaf Canadian coinage, Australian Kangaroo gold coin, American Buffalo, and Austrian Philharmonic coin– there is no metal other than gold, meaning each are 24 karat (or .9999 pure) and each weighs exactly one troy ounce. Bottom line, all of the above coins are of nearly identical value because the "melt value" of gold is the same – whether the purity is 22k or 24k. Some of the older and historic coins – such as the gold coins before 1933 like U.S. Libertys and Indians and the popular coins from Europe like the British Sovereigns, Swiss and French 20 Francs, and others – contain 90% gold. These coins were circulating currency and therefore needed the extra durability and strength provided by a 10% copper alloy. But once again, the gold melt value is all that really matters. There are few situations where purity does matter and must be considered. When purchasing bullion specifically for a precious metals IRA, the IRS requires that the products meet a certain purity standard. As a general rule, non-pure gold, silver, platinum, and palladium bullion items will be prohibited for ownership inside a precious metals IRA. However, there is one notable exception to this IRA purity rule, the American Gold Eagle. Even though the Eagle is only 22k (and therefore isn't .9999 pure), Congress granted it a special exemption since it is the flagship gold bullion product minted by the U.S. government. and low-cost way to invest in gold. Another situation where purity is likely to be a factor is with 40% junk silver half dollars. This is a product you seldom see Money Metals Exchange promoting as core investment because the sheer bulk of the 40% silver half dollars makes them less desirable for shipping and storage, as compared to other silver options. And they're generally less popular in the marketplace, which tends to increase the bid-ask spread on these coins. For instance, a full bag of $1,000 face worth of 40% half dollars contains only 295 ounces of silver but weighs approximately 50 pounds. Compare this to three 100-oz .999 pure silver bars where the weight is only slightly more than 20 pounds. So unless the 40% silver can be bought at a significant discount, we generally recommend investors look to other silver options. Bottom line: know what you're getting, be aware of the melt value of gold or silver in the product you are considering, and try to keep your premiums above that melt value low. In most cases, however, the purity of any mainstream retail bullion item doesn't make a whole lot of difference at the end of the day. In short, it's all about the ounces you own. Note: certain products are less marketable and harder to resell; therefore, we also recommend investors stay away from purchasing gold bars (of any size) with a purity of less than .9999 (that's four 9's) and silver bars or rounds that are less than .999 pure. 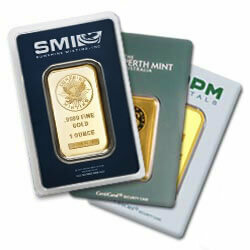 Money Metals therefore only advertises .9999 pure gold bars and .999 pure silver bars. This article was authored by Money Metals Director Mike Gleason.